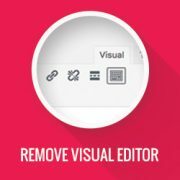 Do you want to remove the visual editor mode in WordPress? 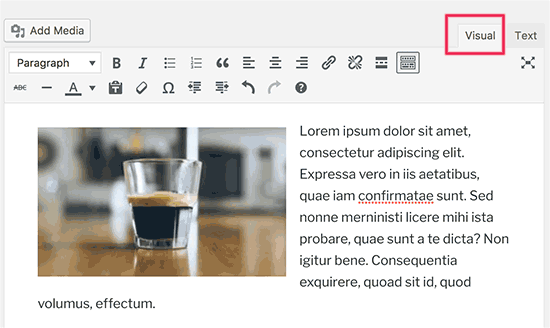 The visual editor in WordPress provides a WYSIWYG interface for writing content. However, many users who are comfortable writing basic HTML prefer to use the text editor. 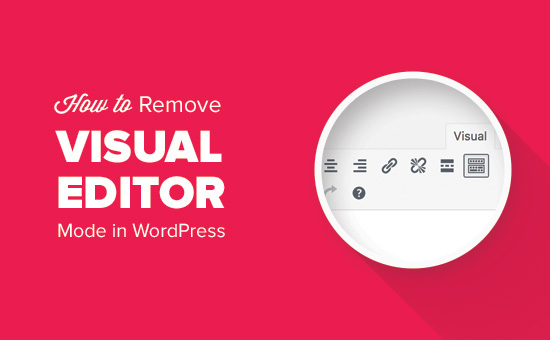 In this article, we will show you how to remove the visual editor mode in WordPress. Why Remove Visual Editor Mode in WordPress? The visual editor offers a convenient way for beginners to write content in WordPress. It comes with a nice WYSIWYG user interface with handy options to choose colors and format when writing posts. 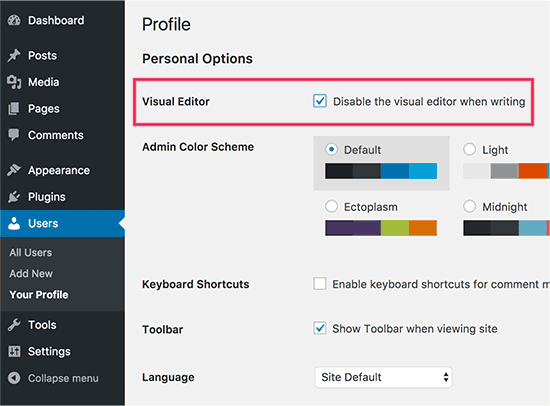 See our tips on mastering the WordPress visual editor. Visual editor can also be programmed to show your posts using the same fonts and colors as your WordPress theme. However, many advanced users prefer to use the plain text editor. It has some very basic formatting buttons and shows raw HTML / plain text when you create content. The biggest complaint about visual editor is that when you switch between Visual / Text mode, it could affect the formatting of your post. Sometimes the visual editor also end up adding additional formatting that’s not needed. These are not big issues, but they can certainly become really annoying. Having said that, let’s see how to easily remove visual editor mode in WordPress. Under the visual editor, you need to check the box next to ‘Disable visual editor when writing’ option. Note: This setting will not affect other users registered on your WordPress site. We hope this article helped you learn how to remove visual editor mode in WordPress. You may also want to see our guide to boost WordPress speed and performance. Can we disable Visual editor only for pages not posts? Your advice is great but surely the best/additional solution would be to stop some of the idiotic behaviour of the visual editor, ESPECIALLY adding and in stupid places, which can disrupt pages completely. I’ve even seen it add tags in the middle of internal style declarations! It also seems to remove HTML comments at times. As one of several people maintaining a certain website, I’ve had to waste many hours fixing the mess made by the visual editor because someone else insists on using it. SURELY it can be made to listen to what the user actually TYPED instead of taking matters into its own hands for no reason. If I type a succession of carriage returns, and didn’t go into text and add , MAYBE because that’s what I actually WANTED. This behaviour has been *programmed* into it, it can therefore be removed. Do you use wordpress visual editor on your website ? Or any plugin of shortcodes instead or any thing else ? Mind sharing ? We use text editor when writing posts. You can see all the plugins we use on our blueprint page. I’m hoping you can help me with my Visual Editor issue. I know this page addresses how to disable the Visual Editor, but I’m hoping you can help to enable my Visual Editor. I am a freelance writer and a client set up a WordPress account for me on her site. I cannot access the Visual Editor. The disable Visual Editor box in NOT checked. And, when I tried to click on Visual, all of my text disappears. The word counter remains the same as if there are invisible words on the page. Perhaps there is something you can tell me that I can forward onto the site owner. 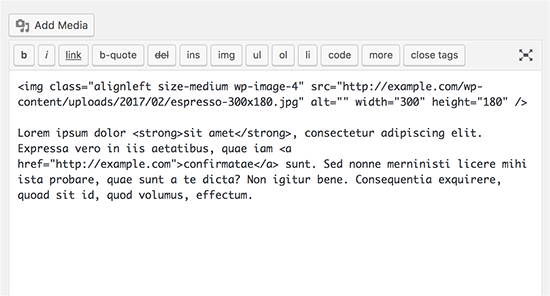 Take a look at our tutorial on how to fix white text and missing buttons in WordPress visual editor. You will need to ask your client to help you solve this issue. Does enabling visual editor erase the html code again? No, but if you edit a post and switch to visual editor, then it may try to fix unclosed HTML tags, etc. This could affect your post’s formatting a little bit. You can go to your user profile and check the option disable visual editor when writing. Hi there! Do you happen to know if it would cause formatting issues if the visual editor is enabled for one user and they were told not to click the text editor button at all (for my client, so they can do things like change text color for a word here and there) and disabled for me (so that I can easily code things if needed)? Thank you!! It should be the first option on your profile page. for WordPress Visual Editor is acting weird, it is not showing up in Firefox and Chrome but working fine in IE… what should be the error, I have even reinstalled the WordPress using the reinstall option in the dashboard..